Located in the eastern path of the Milky Way in southern Ophiuchus 3 degrees north- northeast of Eta Ophiuchi (Sabik), and not all that far from the center of the Galaxy, lies NGC 6309. 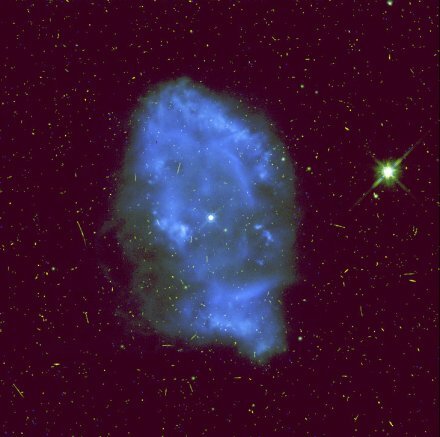 Small and compact, the telescope readily reveals a complex elliptical structure 19 X 10 seconds of arc across. Curtis says of it: "fairly bright" and "quite irregular" with a "southern condensation." 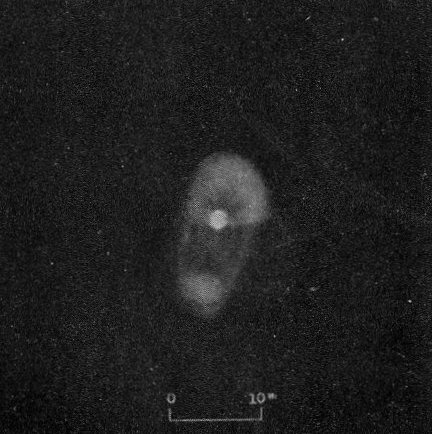 The Hubble image displays what appear to be nested shells with the same "condensation" (rotate the Hubble image about 30 degrees clockwise to bring the two into the same orientation, with north to the top). Called "bipolar" for the two bright lobes, NGC 6309 is actually more quadripolar. Surrounding the compact object seen here is an outer shell more than three times as large, which probably represents earlier stages of mass loss. Measures of distance are all over the place, but center on about 7000 light years, a value that should not be taken very seriously. If at that distance, the inner object averages just over half a light year across, while the diameter of the outer shell (invisible here) is around two light years, half the distance between the Sun and Alpha Centauri. The inner shell expands at about 20 to 40 kilometers per second, increasing outward. Intervening interstellar dust, which fills the Milky Way, dims the object at visual wavelengths by around two magnitudes. Curtis gives a visual magnitude for the central star of 13. Modern measures come close at 13.7, from which (and the brightness of the nebula, which gives the amount of ultraviolet radiated by the star) we derive a stellar temperature of around 90,000 Kelvin and a total (very uncertain) luminosity of about 1800 times that of the Sun. Together they suggest a low core mass of around 0.55 Suns and that the star is still heating, but will shortly begin to cool and dim to become a white dwarf of about the same mass). Left: Image by H. D. Curtis from Publications of the Lick Observatory, Volume 13, Part III, 1918. Right: H. Razizadeh and the ESA/ESO/NASA Photoshop FITS Liberator.